Vortez flew to Taipei, Taiwan to join Computex 2017 to check out new products and technologies offered by numerous participating brands, one of which is ZOTAC. ZOTAC showcased new products at the exhibit including their new and improved VR GO portable VR gaming machine in a backpack form factor, new mini PCs including one that is powered by AMD Ryzen, new gaming PC – the ZOTAC MEK, and the smallest GeForce GTX 1080 Tis to date which we had the opportunity to take a closer look. ZOTAC’s current GeForce GTX 1080 Ti line up consists of six models including the Founder’s Edition model which are all full-sized form factors. At Computex, ZOTAC presents the world’s smallest variant of the NVIDIA GeForce GTX 1080 Ti desktop graphics card and it’s not just available in one model but two – an aircooled variant featuring a dual-fan cooling design and a water-cooled variant featuring a full-cover water block. 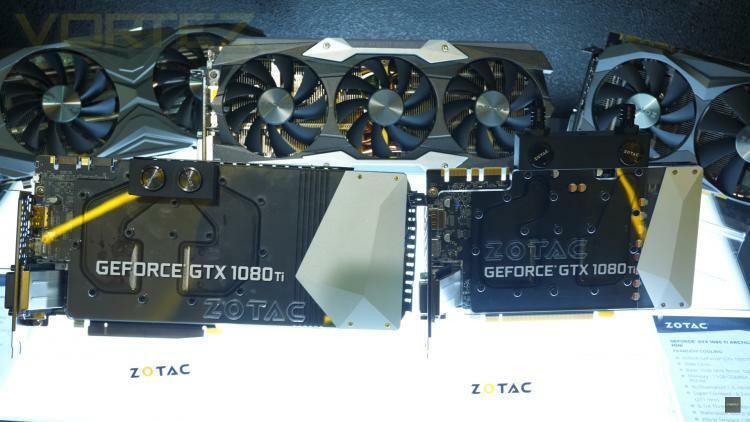 Watch the video below as we check out the ZOTAC booth and the world’s first and only small form factor GeForce GTX 1080 Ti graphics card models.